haahnster's hallucinations: "How far you goin' back?" "WAY back" "And we go a little somethin' like this" "Hit it!" "How far you goin' back?" "WAY back" "And we go a little somethin' like this" "Hit it!" 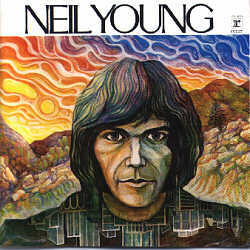 NEIL YOUNG (1969) is the self-titled, solo debut which was released in January of 1969 (although I've also seen Nov'68 listed as the release date). The album had been written and recorded in 1968, almost immediately after the break-up of Buffalo Springfield. There seems to be a bit of a Buffalo Springfield hangover, or maybe it's just Jack Nitzsche's ever-ambitious (over-) production. Oops, this is starting to sound more negative than I mean for it to be. You see, I can't truly duplicate the experience of writing about this album as a debut. It was not the first thing I'd heard by Neil Young. I knew his '70s hits, and owned EVERYBODY KNOWS THIS IS NOWHERE, AFTER THE GOLD RUSH, and HARVEST before I bought this one. So, for a Rolling Stone review from 1969, click here. Side 1 opens with "The Emperor of Wyoming", which is a fairly crisp, country-rock instrumental. Next is "The Loner", which is the true Neil classic from this album. This song is strong lyrically, and fundamentally a rocker, but there's a hint of over-production here. Check out LIVE RUST for an excellent, stripped-down version. "If I Could Have Her Tonight" and "I've Been Waiting For You" both seem to have a similar theme, dealing with wanting and needing, but ultimately not attaining, love. The former is more mellow and country-influenced, while the latter's stinging guitars make me wonder if Neil is actually stalking this poor girl. Side 1 ends with "The Old Laughing Lady", which is slow, mellow, and lyrically interesting. However, it's a bit pretentious in the arrangement. Thank God there's no Graeme Edge-style, cheesy poem at the end, or this could almost be mistaken for the Moody Blues! Side 2 opens with "String Quartet from Whiskey Boot Hill", which was written by Jack Nitzsche (or, "King of the Unnecessary Strings", as I like to call him). This song is a one-minute-long string piece that really shouldn't be here. I'm guessing Jack bought Neil a beer to let him inlude it. Next is "Here We Are in the Years", which has a beautiful piano intro, followed by Neil extolling the virtues of country life ("What a pity/That the people from the city/Can't relate to the slower things/That the country brings"). "What Did You Do to My Life" finds Neil being dumped ("It isn't fair that I should wake up at dawn and not find you there"). "I've Loved Her So Long", like "Old Laughing Lady", was produced by Jack Nitzsche. This one has a veritable women's choir of backing vocalists (yuck). I'd love to hear a demo of Neil doing this song by himself on acoustic guitar. The album closes with "The Last Trip to Tulsa", which clocks in at a fairly massive 9:25. Finally, all the bullsh-t is stripped away. It's Neil and his acoustic guitar, telling the listener(s) about a crazy dream. This is not a long, Crazy Horse guitar work-out. This is a sparse tune, but with wild lyrics that keep it interesting. Neil as solo, acoustic storyteller. This is the real highlight of the album for me. Bottom line: This is a solid solo debut (probably like 3 out of 5 stars, if I did that kind of rating). "The Loner" is a classic that Neil has performed live throughout his long career. "The Last Trip to Tulsa" is a GREAT listen. What detracts from the album as a whole are the distractions of over-production (strings, etc.). From a historical perspective, the best thing about this album is how Neil followed it. By ripping through a rough-edged, guitar-driven rocker of an album (EVERYBODY KNOWS THIS IS NOWHERE), Neil bucked the "more production is better" trend of the times. It was a trend that could have stifled his career. I'd like to think we're all better people because of the direction he chose!